Perfect For Quilters, Cross-stitching, Scrapbooking And Family Gatherings. 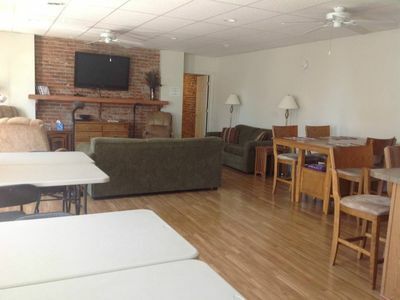 Retreat Center for cross-stitching, scrapbooking, quilting, family gatherings and other functions. Retreat has 3 bedrooms: Bedroom 1 has 5 twin beds and bathroom with tub shower. Bedroom 2 has 2 single, 1 bunk, 1 double bed, and bathroom with tub shower. Bedroom 3 has 4 single, 1 queen bed and bathroom with walk-in shower Main area has fully stocked kitchen (you supply the food), 10 - 6' work tables, living room area with 3 couches and 3 recliner rockers, and bathroom with walk-in shower. Large work room has 20 - 6' work tables (more available to set up) small kitchen and bathroom.